Home » Healthcare / Medical » Patient Charting Systems » Mobile Chart Racks » Mobile Chart Binder Carts » Mobile Chart Rack (24 Space) 3" Ring Binder Storage Cart - Our Top Seller! 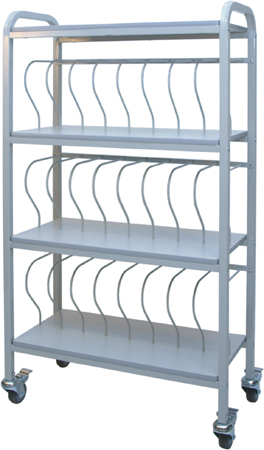 Our best selling mobile chart rack is ideal for hospital and long term care chart storage at the nurses station. Features include welded color coated frames, organizers and shelves. The MCBR-24's design allows for clear identification and easy access. The MCBR-24's design allows for clear identification and easy access. It features four 3" total lock casters and the rigid 1/4" rods securely support binders and charts. Holds twenty four (24) 3" binders. This chart racks is shipped assembled.